Does anyone use anything to seal new heads to new jugs when adding a new top end to a 1600 dual port engine .? Nope. Just make sure all the surfaces are clean and torque 'em down. I do put a very light coating of "Right Stuff" sealant on the pushrod tube seals though. Thanks. 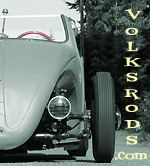 I did as advised by several older VW gear heads to lap them together with lapping compound prior to assembling them . I have done the lapping procedure to make sure it is a good seal on non stock engines.